This was one of the slowest of the Pern series and took a really long time to get into. 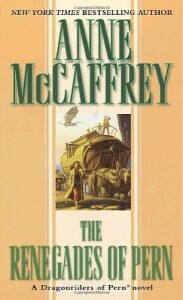 I think in this case Anne McCaffrey didn't do as well with her style of jumping around in the time stream. This book seems to cover too much time and contained too many gaps that left me wondering what was going on more often that I would like. I didn't read the book very much though especially the exploration of the southern continent and how the new characters and their story lines connected too old characters and storylines.